Class-based marking provides the most functional general classification and marking tool in IOS, as of IOS 12.2 mainline. Class-based marking provides the largest number of fields for classifying packets, and the largest number of fields that can be marked. 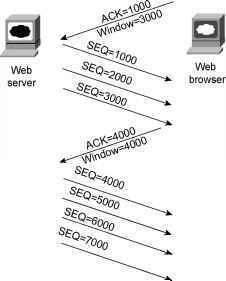 It uses MQC for configuration, separating the classification details from the QoS action. Refer to Table 3-17, in the Foundation Summary section of this chapter, for a complete list of classification and marking fields used by CB marking. 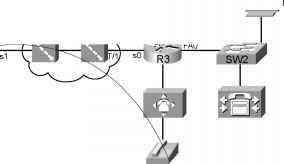 The term locations refers to a CAC feature in a Cisco CallManager centralized call-processing environment. 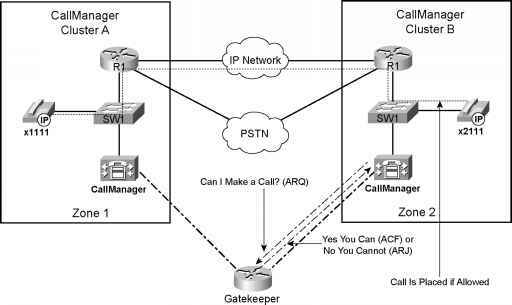 Because a centralized call-processing model is deployed in a hub-and-spoke fashion without the use of a terminating gateway at each spoke, an IP telephony CAC mechanism must be used to protect the desired number of voice conversations. Locations are designed to work in this nondistributed environment. 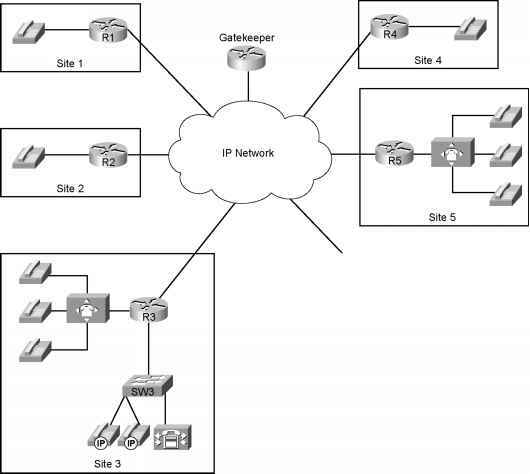 Figure 8-20 shows a typical CallManager centralized call-processing model. 5 Define the DiffServ term DSCP, including what the acronym stands for. 6 Define the DiffServ term PHB, including what the acronym stands for. 7 Compare and contrast the terms shaper, meter, and dropper, according to DiffServ specifications. Suggest typical points in the network where each is used. 8 Compare and contrast the contents of the IP ToS byte before and after the advent of DiffServ. 9 Identify the most significant difference between FRED operation and WRED operation. 10 List the three categories of flows defined by FRED, and identify which category has its packets discarded most aggressively. 11 Taking as many defaults as possible, list the configuration commands needed to configure precedence-based FRED on interface S1 1. 12 Taking as many defaults as possible, list the configuration commands needed to configure DSCP-based FRED on interface S1 1. 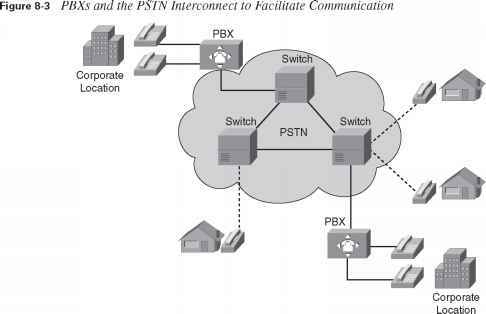 The IP Phone or voice gateway must collect 20 ms of voice before it can put 20 ms worth of voice payload into a packet. 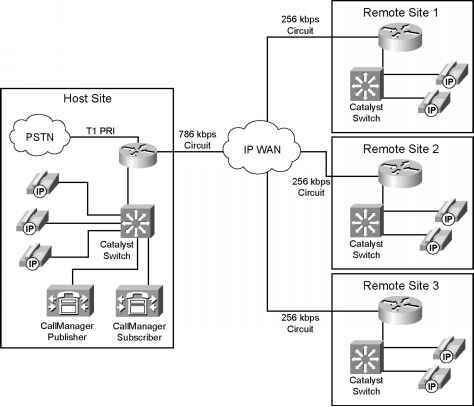 (The defaults for G.711 and G.729 on IP Phones and Cisco IOS Software gateways are to put 20 ms of voice into an RTP packet the value can be changed.) Therefore, for the sake of discussion in this book, we consistently consider packet delay always to be 20 ms in examples. That is, the speaker must talk for 20 ms before a packet containing 20 ms of voice can be created. 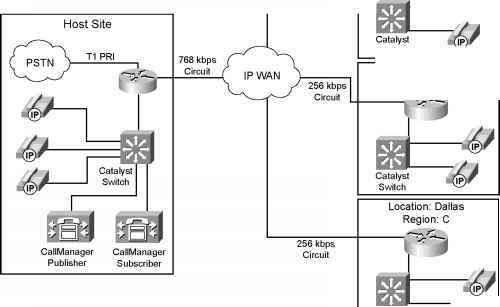 Utilize QoS Device Manager to monitor performance, establish baselines and configure QoS policies. Utilize QoS Policy Manager to configure advanced QoS policies, scale policy deployment, upload verify roll-back policies, and deploy QoS policies by external time-based event-based scripts. Configure Cisco Service Assurance Agent to measure key SLA metrics and monitor network performance between local and remote devices. Monitor and troubleshoot network performance with IPM and SMS.